25 July 2018 || Animations! Reynir, Mikkel and Emil. 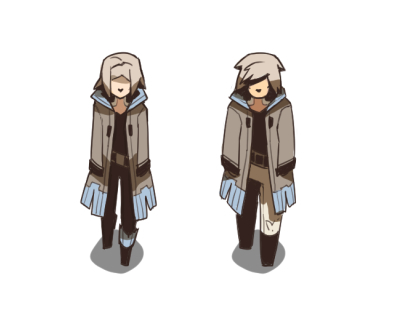 Since I've been aable to use Sigrun's animation frames as a guide these were way faster to do than hers. I've been able to knock out one in only a day (so one per my weekly side project day). Plus all their idle standing animations are done too, finished all those today. Those were super simple though, I've opted for just going with a mere breathing animation. For Sigrun I had gone all in and animated a slight clothing and hair movement too, but I opened the file for reference and immediately went "uuuuuhhh, no way I'm doing this for all 6 characters, nonono." Sigrun can keep her fancy standing animations, the rest will do fine with just a little breathing movement!